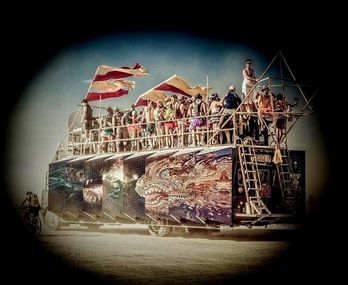 The Mystic Flyer is the Ambassador Vehicle of Camp Mystic whose mission is to bring together a Global Collection of artists, musicians, and thought-leading speakers in expanded contact with the citizens of Black Rock City and others by traveling to events all over the World. 5/13: Steampunk Masquerade, Alameda, CA. ​5/19-5/21: MakerFaire. San Mateo, CA. 8/27–9/4: Burning Man, Black Rock City, NV. 10/14: Decompression, San Francisco, CA. 10/19-10/22: Autumn Lights Festival, Oakland, CA. Keep us Flying. We appreciate your ongoing generous support! Not only does your funding help us bring the Mystic Flyer all over the country, but are also building spectacular new additions to the Mystic Flyer, Phase III plans include a breathtaking illuminated head sculpture, fiber optic wings, and improvements to our DJ booth and Sound System, and on the inside we are developing new Time Travel Technology tracks and brand new interactive illuminated environment to “fly” your consciousness into new dimensions! 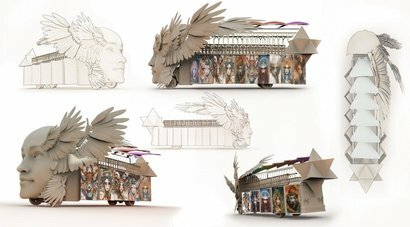 Come take a Ride, explore the Art & Engineering of the Mystic Flyer.